Entomo Farms & Mayor Tory: A Winning Combination! 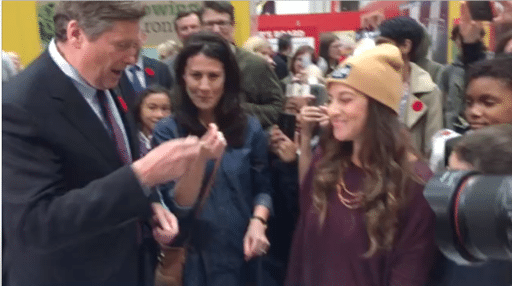 Toronto’s Mayor John Tory stops by the Entomo Farms booth and gives our whole roasted crickets a try and two thumbs up. This entry was posted in Community Hub and tagged cricket flour, cricket powder, cricket protein, eat bugs, eat clean, eat crickets, eat insects, edible bugs, edible insects, Entomophagy, Fiber, food security, insect flour, insect powder, insect protein, mayor, superfood, sustainable, Toronto.